Change is inevitable, as are people’s opposition to it. A project manager must help their team adapt, as leadership coach Susanne Madsen explains. Susanne began by noting that it’s often not the change that upsets team members as much as fear that whatever is coming down the pike is going to take away something they want or add something they don’t want. Once you’ve got your team open to and then embracing the change needed to complete the project, not only will the team work more efficiently together, but you’ll have won the invaluable victory of gaining their trust. Pro-Tip: These steps are designed for a leader working with their team, but sometimes the resistance is coming from equals or superiors in the organization. That can be a challenge, but there are ways to wage influence even when you don’t have clear authority. Use these strategies up and down the chain, and you’ll begin to see clear results. Hi. I’m Susanne Madsen. 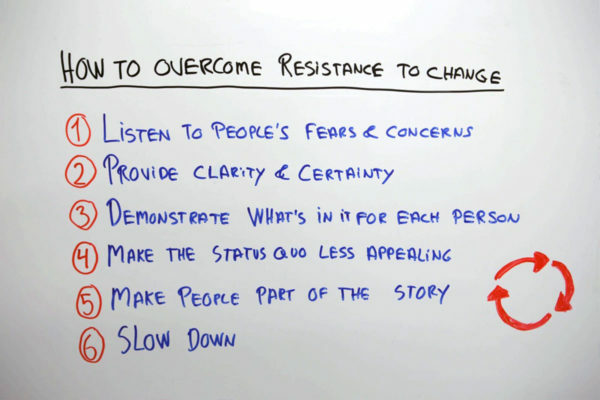 Welcome to this whiteboard session How to Overcome Resistance to Change. Resistance to change is a term that we tend to label people with when they are not willing to adapt to a new change or accept it. But oftentimes it’s not the change itself the people resist. They resist because they’re fearful they might lose something or that they would be no good at coping with the new state. Let’s look at how we can help people to overcome those fears. The first step is to listen to people’s fears and concerns. Because this is an emotional thing, we’ve got to engage at that level. Listen to what people believe is going to happen. What are they afraid of? Empathize and try to see it from their point of view. We also have to provide clarity and certainty. If you can give any guarantees at all that will make people calm down, do so. Also provide clarity about what will happen and what won’t happen. Some people are afraid because they create doom day scenarios and their minds run loose, but that’s because they don’t actually know what’s going to happen. You can help them provide that clarity by giving them more information about the change. Next, demonstrate what’s in it for each person. For sure, I’m going to be more pro a change if I understand that there are benefits for me. Put yourself in the other person’s situation and look at all of the ways in which this person would benefit, and convey that to them. There’s always two sides to the story. You also have to make the status quo less appealing. If you want people to shift from a current state, the status quo, to a future state, you’ve got to make the status quo less appealing, and demonstrate that there are consequences if we don’t change. Maybe we are going to fall behind competition. In change management terms, we talk about creating a bit of a burning platform. Don’t create too much of a burning platform because that may just make people even more fearful, and that’s what you don’t want. Making people part of the story is another powerful way to make people overcome their fear of change. That means that you can draw people into it. Give them a role to play. You see, if you change something and I’m not part of it, I can criticize you and say well it’s just being done to me, and I can play the victim. But if I’m drawn into the story, if I have a role to play, then it’s much more likely that I’m going to be feeling positive towards this change. Lastly, slow down, because change can be emotional. It takes time to adapt to it and digest this emotional change. By slowing down the rate of change there’s a higher degree that people will be pro the change. What do Portfolio Managers Do?